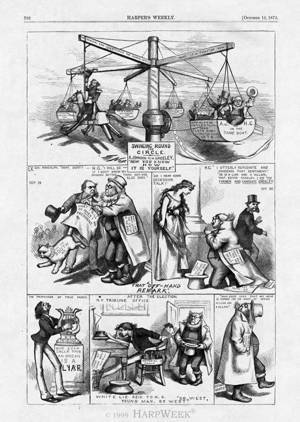 In the November 23, 1872 issue of Harper’s Weekly, Nast offered up a self-caricature in a lament to the end of the campaign. The disgruntled cartoonist wonders, “What am I to do now?” Nast stands isolated in the foreground, while behind him a crowd rejoices in front of The New York Times building, where placards proclaim Grant’s “Grand Victory,” the destruction of “The Senatorial Cabal,” “Sham Reform Exposed,” and in tiny characters, “H. G. Gone West,” an allusion to Greeley’s famous advice to enterprising young Americans: “Go west, young man, go west.” At the upper-left, an announcement on the Tribune office building reads “The Greeley Triumph Postponed.” After two years of intense professional exertion during the anti-Tweed and anti-Greeley campaigns, it is hardly surprising to learn that Nast was exhausted. He would take a six-month leave-of-absence from Harper’s Weekly in 1873.